There’s lots of other quackbusting action on the site, listed by topic down the right hand side of the page, and there’s much more on the Brainiac fake experiments thing in tomorrow’s Bad Science column which I’ll post as soon as it goes live on the Guardian website. A TV science programme stands accused of faking experiments to make them more exciting. Brainiac, the award-winning Sky One series fronted by Richard Hammond of BBC2’s Top Gear, faces criticism from scientists who say its makers turn to special effects when their experiments do not work. In one episode the show explained how a full bath tub would explode when volatile metals rubidium and caesium were dropped into the water. It is claimed that when the experiment did not have the desired effect, producers simply rigged the tub with dynamite. While Hammond talks viewers through the procedure as if it is for real, close inspection reveals a wire leading out of the bath. A Sky spokeswoman said: “Brainiac is an entertainment show and the emphasis is on having fun. But Dr Goldacre said: “Sky saying they are showing what ‘should’ happen is just bizarre. That’s not what science is about.” He said he had asked Sky to confirm the authenticity of other Brainiac experimentsbut the broadcaster had refused. The Sunday night show, launched in 2003, has been hailed for making science popular with children. It recently won a Royal Television Society award. Past features include testing if a mobile phone can ignite petrol vapours, examining effects of electric shocks, and blowing up caravans. It’s in the Independent today as well. I do find it slightly strange how newspapers don’t want to mention that I did this story for the Guardian (who I love): so the “Bad Science Website” is also quoted in the Independent as the source. The funny thing is, I mean, I realise this isn’t the most exciting story in the world that anybody would want to spend a lot of time researching, but they just lifted a few quotes, and if they’d emailed me I could have given plenty more examples and damning background. Ho hum. Only trying to help. To viewers of the science programme Brainiac, the exploding bath seemed spectacular proof of the potency of what the presenter described as “the two dog’s nuts of the periodic table”. In fact the blast was not the result of a meeting between water and rubidium and caesium, but the triggering of a bomb, Sky television confirmed yesterday. 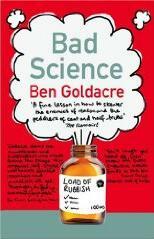 The artifice was spotted by Dr Ben Goldacre, who runs the Bad Science website dedicated to exposing pseudo-science. The programme promises viewers that the experiments on the show – ranging from blowing up caravans with different gases to seeing if a mobile phone ignites petrol vapours – arebased on proved science. Sky said its viewers would be aware when the effects of any experiment had been exaggerated. Those responsible were longer part of the production team. I particularly enjoy how, although I said I was a medical doctor, they call me a neuroscientist, which I last was in about 1997, because they want a scientist slamming Brainiac. And they quoted the source as www.badscience.net instead of the Guardian, I guess because it looks groovier to lift stories from websites rather than other newspapers. Anyway, god knows why I’m whinging, I think it’s great that somebody else picked this up. For a show that trades on how wacky and crazy it is for really doing dangerous stuff, Brainiac are wriggling pretty pathetically. Ooo I reckon I can write a precis of one of your stories and copy a couple of comments. Can I be an Evening Standard journalist too? On a semi-related topic, it’s a shame that BBC2 have decided to show versions of Mythbusters which are cut down, badly revoiced and, in my opinion, dumbed down. It looks like the experiments will be hurtled through with some of the thought processes cut. Their false starts and back-to-the-drawingboard moments are often the most interesting bits and, I would have thought, give a rather more realistic idea of what goes into designing a successful experiment. For BBC2 to be showing a less intelligent version of a programme than that screened on a commercial satellite channel must be a new low. It’s pretty standard policy for papers not to give credit for a story to another paper, and can you imagine the Standard admitting the Guardian got there first? Not a chance. the thing that really amazed me, I have to say, was that no single paper picked up on the malyszewicz MRSA thing, given that it de-rugged about 20 major headline stories. although to be fair i did get one call from a tabloid who wanted to do a story on how malyszewicz was evil and had ripped off and defrauded the papers. considering most of the papers, if not all, had been told point blank that his lab was a joke, and their story was too, at the time, this struck me as being a slightly pisspoor spin on the story. good to see the Standard picking up on this indeed Ben, but to be honest i’m not that amazed that papers picked up on this rather than Dr MRSA. in this story the Standard gets to debunk a TV show, with the backing of, as they put it, a neuroscientist, and the debunking doesnt affect their own stable of publications. however, if they ran stories about Dr. Malawotsit turning out to be a fraud, they’re in trouble – as you said above, your expose on Malawotsit ‘de-rugged about 20 majour headline stories’ – some of which may have appeared in the Mail/Sunday Mail/Standard, meaning the Standar themselves are hardly gonna slate their own stable-mates…! There is very little chance that any newspaper will mention a rival if they can get away with it. Art, there is something very similar in the differences between the Discovery US version of Mythbusters, and the UK version. I was quite disheartened to tune in to the Discovery UK version only to find the ‘build team’ (US version) called the ‘Junior Mythbusters’, and the overall tone of the narration far closer to Braniac. So it’s a little worse than the BBC dumbing down, they’ve dumbed down something that was already dumbed down. The sequence went something like this Entertainment (US) -> Dumber Entertainment -> BBC management that think all the unwashed hordes are interested in is football and the tabloids. Or something remarkably similar to that. Although I have something of a soft spot for Mythbusters, for all it’s faults its a show that hits a balance between entertainment and education that compliments both. I would far rather see young people watching Mythbusters than Braniac. Not once have I seen big-breated girls as part of a Mythbusters experiment. Also, the Mythbuster viewer shows are quite good, because they have re-tested myths on the basis of viewer input. Some of there previous results turned out to be wrong and they admitted it. So it’s not a bad thing that it’s on BBC 2. People with digital telly will want to watch it on the Discovery Channel. Ben, with papers quoting you on Brainiac vs not mentioning Dr MRSA, at least if their readers do follow the link to the site, it may get them reading other posts and then they’ve accidently shown their readers their stories are a big pile of the proverbial. What really gets me is the use of ‘dumbed-down’. Dumb means mute not stupid. Isn’t it implied in www.badscience.net/?p=261 ? And the other bits which I can’t track down now? Hmm. I seem to have interpolated more than I realised. However… if your source wasn’t saying “This experiment will be good” or “This won’t work” or “I don’t know”, probably -before- they decided to spend the day filming it, then what were they all playing at? Have I also interpolated that your source is a science guy, just because on TV he’s called Doctor something? But he’s as much a doctor as David Tennant is? I do hope Dr G hasn’t lost him his job. I want to say, in Brainiac’s defence, that it did coin the phrase “You can never blow up too many caravans”. Coracle, dumb hasn’t meant just mute for about one hundred years. I know this because I’ve looked it up. Ben G: Well, it’s probably a bit late now re: the ES etc, but what you should do is next time BadScience.net gets quoted as a source and readers of other publications get directed here, explicitly mention “the other stories listed on the right, including MSRA etc etc”. Point everyone arriving straight at that. That might get the newspapers’ goats! Dr Bunhead isn’t a real doctor, I see (I am suprised, he wears glasses and everything). I do believe that the only way to really get an MPhil in Chemistry (after doing an MSc and not at Cambridge) is to screw up your PhD or leave before you have finished it – that bodes well for his scientific credentials. For shame! I looked on the link and he did his MSc and MPhil in the same area as me! Looks like I am destined for a career as a circus charlatan.